"You remember we're drafting each other this year, right?" On Tuesday night, PhillyVoice will be hosting its 2018 fantasy football draft. And considering the number of league managers who also consider themselves Eagles fans, there's a good chance any Eagles player worth taking is off the board before the end of the night. With that in mind, we decided to take a look at which Eagles players are worth targeting in your fantasy leagues, and which ones might be worth waiting for the waiver wire. First, before getting into my rankings, let's take a look at how ESPN projects the top 10 Eagles will fair this season, ranked by their total projected points. *According to Matthew Berry's preseason PPR Top 300. Now, let's take a look which Eagles players you should most want on your team, and when you should take them. The upside: Ertz is one of the best tight ends in the league, and has a great rapport with both Nick Foles and Carson Wentz. And he seems to get better every year. The downside: Before 2017, when he caught eight touchdowns, Ertz had never caught more than five in a season. I know, I'm reaching here. When to draft: Definitely wait until Gronk is off the board, but in a 10-person league, you shouldn't wait any later than the third round to scoop up Ertz if you're dead set on having him. By the time it snakes back around for the fourth round, there's a good chance he's already gone, especially in a PPR format. The upside: Wentz missed the final two games of the Eagles' season and still led the NFL with 33 touchdown passes, the last of which he threw with a pair of torn knee ligaments. He's looked great in his recovery and is just waiting for the final medical clearance for contact before he can return. 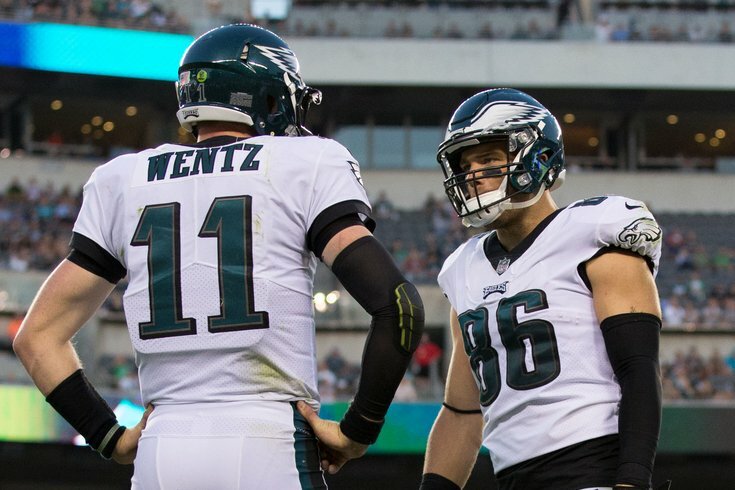 Reports are that his return won't come until Week 3, but as long as you can get a backup to get you through the first two games, don't let that injury scare you away from drafting Wentz. He's one of the best quarterbacks in the NFL and has more than a few weapons at his disposal. Will there be rust? Probably, but he should be in prime form by the time the fantasy playoffs roll around. The downside: Literally the only downside for Wentz right now is his injury recovery. If that scares you away, it's understandable. But that doesn't mean it's right. When to draft: On average, Wentz has been the seventh QB taken in ESPN drafts, averaging out around the 77th pick. If you load up on RBs, WRs and TEs in the first five rounds, I don't see any reason you couldn't take Wentz in the sixth. Just make sure to get a serviceable backup for Weeks 1 and 2. The upside: In 2017, Agholor finally showed Eagles fans what the team saw in him when he was drafted 20th overall in 2015. He caught eight touchdowns last season, but more importantly saw his catch rate go from the low 50s to 65.3 percent. Not only did that help build his confidence in himself, but it also helped build some confidence among his quarterbacks. Another big showing, and Agholor could finish this season as the Eagles' best receiver. The downside: Was last season a fluke? Will the pressure that comes with raised expectations get to the young wideout? Eh, it's doubtful. When to draft: Don't be afraid to jump up and grab Agholor in the 8th or 9th round. The upside: He made an immediate impact on the Eagles offense last season when he arrived from Miami. Now, without LeGarrette Blount, Ajayi steps into the spotlight as the Birds' lead rusher. The downside: Ajayi has a history of being banged up — and there's few things more frustrating than losing one of your top picks to injury early in the season. 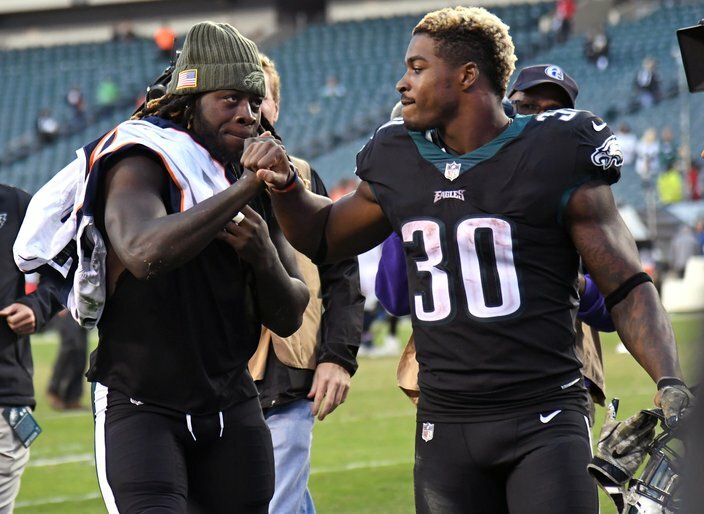 Furthermore, Doug Pederson (or, in this case, Duce Staley) likes to mix and match his running backs throughout the game, so there's likely to be more of a split between Ajayi and Corey Clement than some are expecting. When to draft: Be cautious and wait until at least the fifth round (in a 10-team league). The upside: He's just a Jay Ajayi injury away from being the Eagles' lead running back. Furthermore, he showed last season that he's more than capable of being a third-down back, which could steal some touches away from Darren Sproles. Expect to see a lot of Clement this season. The downside: The Eagles like to spread out their carries, and while that may seem like a good thing for a backup running back, it can actually be infuriating when you have no idea whether he'll get three carries or 13 carries in any given game. Furthermore, he's young, and there's a chance he takes a step back in Year 2. However, I see just the opposite happening. When to draft: Clement is only owned in 28.1 percent of ESPN leagues and is likely to be one of the last players taken in your draft — if he's taken at all. Don't be afraid to take a flier on him a little bit earlier than that, especially if there are a bunch of Eagles fans in your league. The upside: When healthy, he's the Eagles' best wideout. Heck, based on his play last season, he may be the Eagles' best wideout even when he's not healthy. The downside: He's still not healthy. Jeffery played through a torn rotator cuff last season and still hasn't been cleared to play. The good news is, the Eagles recently activated him from the PUP list, meaning he should be back on the field in the next couple of weeks. Busts: Which players are worth avoiding, or are over-hyped? Sleepers: Which players are worth a gamble in your draft? When to draft: With his return date still unknown, there's a good chance to get some value here. If he's still there in the eighth or ninth round, it might not be a bad idea to grab him up. The upside: They're good at creating turnovers and sacking quarterbacks. They've also made some big special teams plays in recent years. More than anything, both units (defense and special teams) have been consistently good for a few years now. When to draft: Wait at least until the first defense is taken (probably the Jaguars somewhere in the seventh round). If you really want them, that's the time to go get them, since they're the second- or third-ranked defense, depending on where you look. Just be careful not to reach, there are a few good defenses out there that should be around well into the ninth and tenth rounds (and beyond). The upside: Wallace is basically making over the Torrey Smith role, and as we saw in 2017, that role comes with some big-play potential, something Wallace is more than capable of delivering. And with Alshon Jeffery reportedly set to miss the first two weeks — not to mention Mack Hollins still not ready — the upside for Wallace could dependably largely on what he's able to do during those first few weeks. If he struggles, especially during a time when his targets should be up, that's going to be a bad sign moving forward. The downside: Wallace isn't known as a volume guy, and in an offense that's full of weapons and loves to spread the ball around, that could spell fantasy trouble. Despite racking up 72 catches for 1,017 yards in 2016, Wallace has struggled to find the end zone in his three seasons since he last posted double-digit touchdowns in 2014. In fact, the former Ravens, Dolphins and Steelers wideout has only managed to record 10 touchdowns total over those three seasons. When to draft: Somewhere in the final two-three rounds. The upside: He catches a lot of passes, and, despite his age, still has the ability to make even the best defenders miss in the open field. The downside: Between his season-ending injuries last season and the emergence of Corey Clement, it's hard to see Sproles getting the kind of volume you'd want to see from one of your fantasy starters. When to draft: You probably shouldn't. Currently owned in less than 10 percent of all ESPN leagues, there's a good chance he'll be available on the waiver wire once your draft is over. The upside: Elliott is money from long range. The downside: Doug LOVES going for it on fourth down. And Elliott tends to struggle from inside 40 yards, which is bad news since misses count as negative points in most leagues. When to draft: Take him with your last pick (or your second-to-last, if you're feeling adventurous).